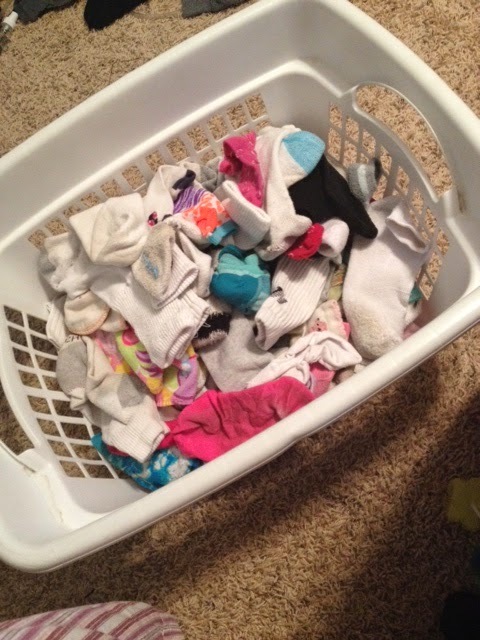 Sock basket… AFTER I’d matched socks….. OYE! My problem is, I’ll get it clean… and then life happens and two days later, it’s right back where we started and then I get depressed about it, drink Dr Pepper, and it just gets even worse. Repeat this cycle 10,000 times over the last few years. So on Monday, I started tackling my house, yes, to get it clean, but also on a mission to “fix” some of our habits that are broken. I’ve rearranged closets, making spots for things. I’ve added/switched hooks. I’ve enjoyed my new washer/dryer immensely by cleaning all bedding—I won’t embarrass myself in mentioning just how long it has been since they’ve been cleaned. And then, I came to this evil monster who invaded my house upon my marriage to my husband. It always resided in our house as I grew up, but I was determined to keep it from my new home once I was married. Alas, it attacked and won. Yes. The evil sock basket. I really do hate the thing. With an extreme passion. And lately, it’s just getting worse. We have 6 kids, various feet sizes, plus my hubby and I. And lately, instead of even worrying about going through the painstaking process of pairing them, I just chuck them ALL in there as I come across them while folding clothes. Kids are left to find their own matches. Usually they go to school with two different socks on. Hey, that’s cool now or something, right!?!? But to make matters worse, Annabelle has recently found the sock basket. Not to find her own socks, mind you. That would be too amazing. No, she likes to sit and ride and play with the basket. With NO socks in it. Thus the reason I’ve walked into my bedroom numerous times over the last two weeks, only to find an untold number of socks littered all over my floor…. many times amongst dirty ones that were thrown there. So, I went on a mission this week to find the solution. Good ol’ google and I had a grand time of it. Some suggestions were laughable—like safety pin pairs together before going in the wash. (an actually pretty common suggestion, which was surprising to me.) If you know my family, you would know how incredibly funny this idea is. And seriously… I have FOUR KIDS. Handling dirty socks to match them and putting pins in them, then having to unpin them later… that is some poked toes waiting to happen right there.And they really just wouldn’t do it more than once or twice. Another suggestion made me almost drop to the floor in hysterical laughter. Oh yeah. INVITE the evil into your house, why don’t ya! So, finally, I found what I was looking for. I kinda had something like this in my head, but when I saw this, I wanted to shout, YES YES YES. Here is the link to this brilliant woman’s blog….. 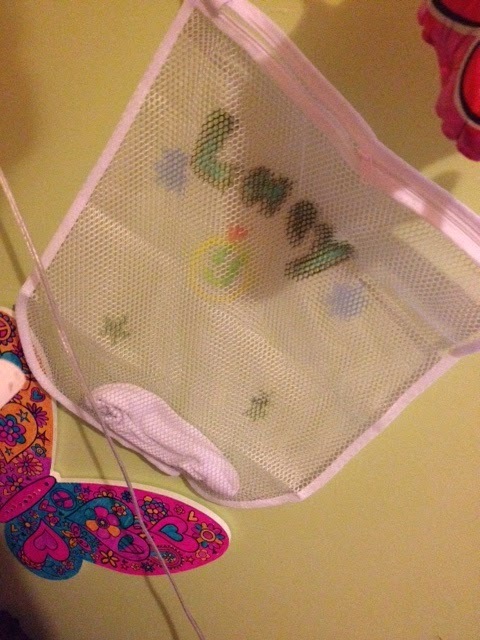 The idea is to give each kiddo/family member a laundry bag. Take off your nasty socks… insert into bag. Collect bags once per week… wash…. redistribute bags…. let them pair their own socks. Oh yeah. Mommy LIKES THIS. I don’t have a verdict on how it has worked yet, since we’re just now implementing. 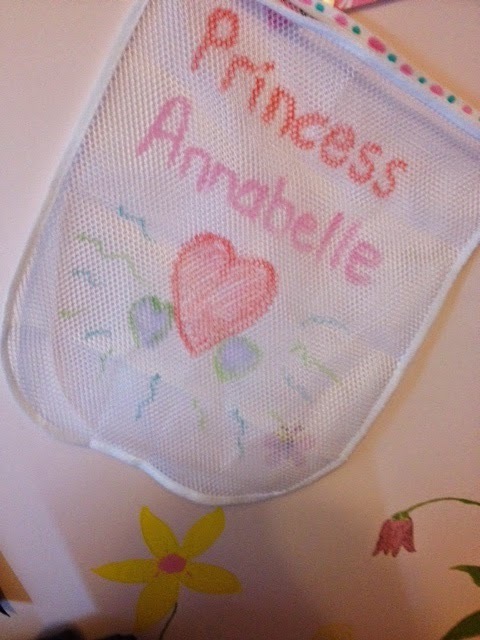 We also let them decorate their own bag (I did Annabelle’s) and they LOVED that. But I’ll let you know how it goes. Meanwhile, if anyone else has suggestions on how to stop the MADDNESS— or maybe a anti-sock-basket-spray or something??? I’m all ears! Your blog made me laugh!!!! I love "fun" socks, and in thorough cleaning of my room (I was moving), I found all but 5 or 6 sock mates. I agree with you! Losing socks is one of my biggest pet peeves. Where DO they go? We are a family of 5 and my house has been clean for a total of 3 hours (if that) before it is a mess again! I find it very discouraging too. I've been trying to as Elsa would sing "Let it go" however that is easier sung then done. I love that you shared this and I so appreciate how honest you are. I often joke with my husband that our beds get washed bi annually….but its not that far from the truth! There is so much on the go all the time that cleaning just does not make the top ten. I may try your sock trick but not sure the kids or myself for that matter will follow through. Be blessed! Thanks for sharing. Krista, you reminded me of a cartoon from Rose is Rose. She goes to the backdoor ( in a dream) and there stands an alien with all the missing socks. Her husband finds her pounding on the kitchen table crying they brought them all back. Good luck to you.